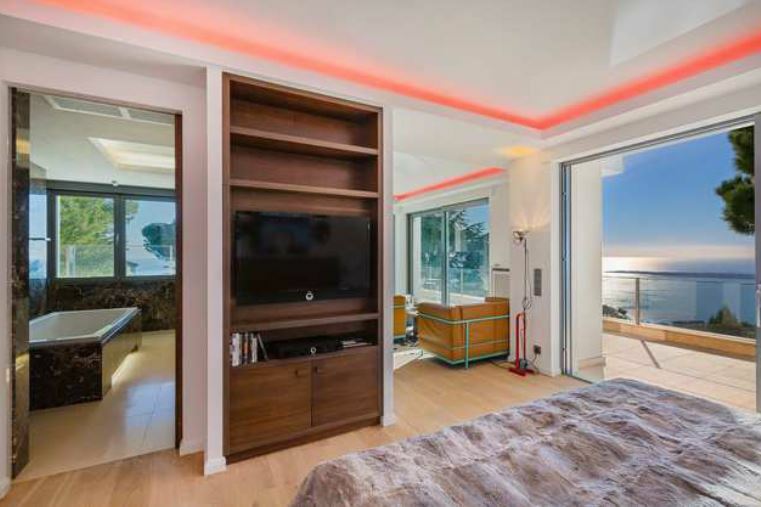 This beautiful contemporary property is situated in the heights of Cannes and enjoys a panoramic view of the sea, the Lerins Island, Cap d’Antibes and the Esterel hills. The property comprises of 4 bedrooms in the main villa and a 5th bedroom in the independent apartment located within the grounds. The large living and dining room open out onto a fantastic furnished terrace where guests can enjoy the sunny Mediterranean climate. The modern kitchen is adjoining the living spaces. The master bedroom suite features a beautiful private terrace as well as a TV lounge, a dressing room and a full en-suite bathroom. A single and a double bedroom are located on the 1st floor of the villa and both have TV’s and share a lovely bathroom. A 4th double bedroom is situated on the mezzanine floor and includes an en-suite shower room. The independent apartment consists of a double bedroom, a bathroom, living room and an American style kitchen. The infinity swimming pool allows guests to experience the incredible views whilst relaxing in the most luxurious of settings.